The holiday classic, Peanut Butter Blossoms, have gone gluten-free and you can’t even tell! This cookie is a classic. We all know that. But do you ever make them at any other time than Christmas? I don’t and I have no idea why! Gluten-free Peanut Butter Blossoms can (and should!) be enjoyed year round! 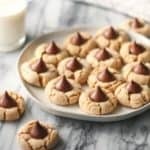 In case you don’t know, a peanut butter blossom is a peanut butter cookie that, as soon as it’s comes out of the oven, gets a Hershey’s kiss pressed on top! It turns out to be the most adorable cookie and is a staple in my holiday baking repertoire! I mean can you really go wrong with the combination of peanut butter and chocolate?? I don’t think so! 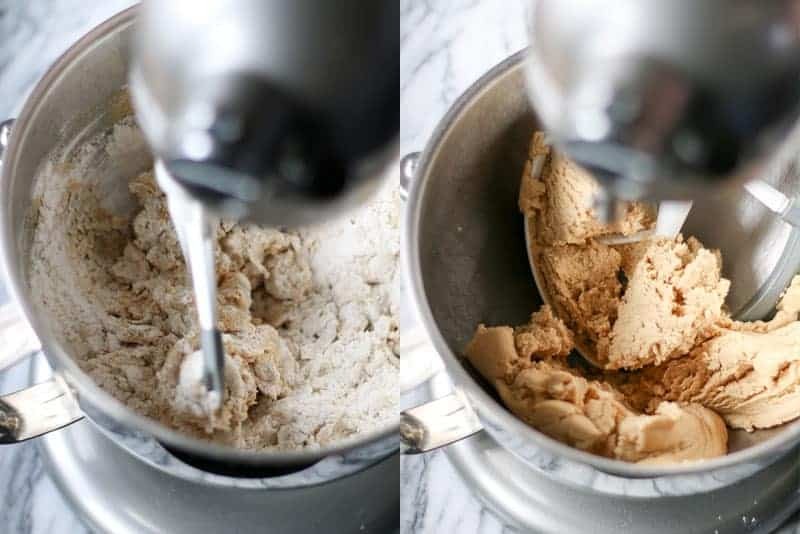 Making these cookies is the same as any other cookie: blend the dry ingredients, blend the wet ingredients, then blend it all together. For the dry ingredients, I went with my favorite flour blend: Pamela’s Artisan Blend All-purpose Flour (affiliate link). I stick with what works, ya know?! Combine the dry ingredients separately first and set it aside. Then cream together shortening and peanut butter. Followed by brown and white sugar. 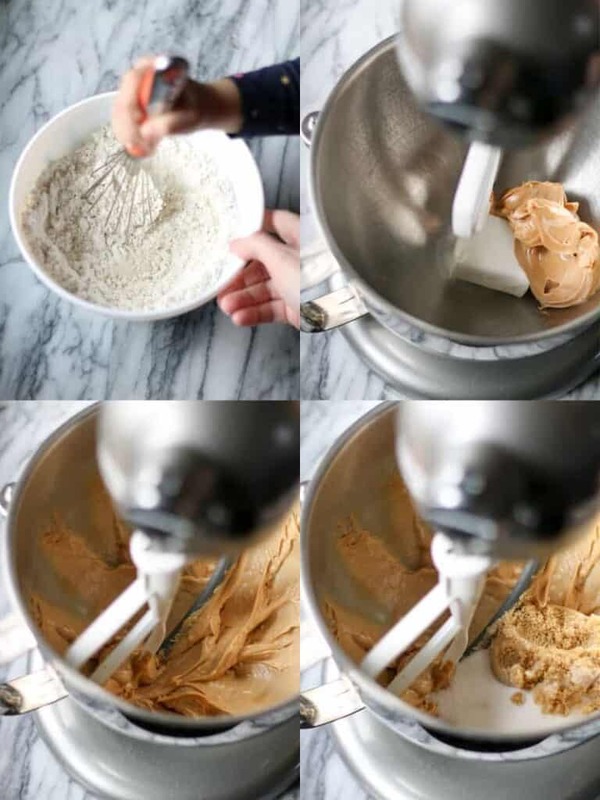 Blend in the peanut butter, shortening, and sugars until the mixture is creamy and fluffy. Then add in the egg, milk, and vanilla and mix well. Then it’s time to add in the dry ingredients. Blend in those dry ingredients until well combined. Now for more fun! Roll 1 tablespoon of dough into a ball and roll that ball in some more sugar. Place them on a lined cookie sheet. While they’re baking unwrap the Hershey’s kisses. 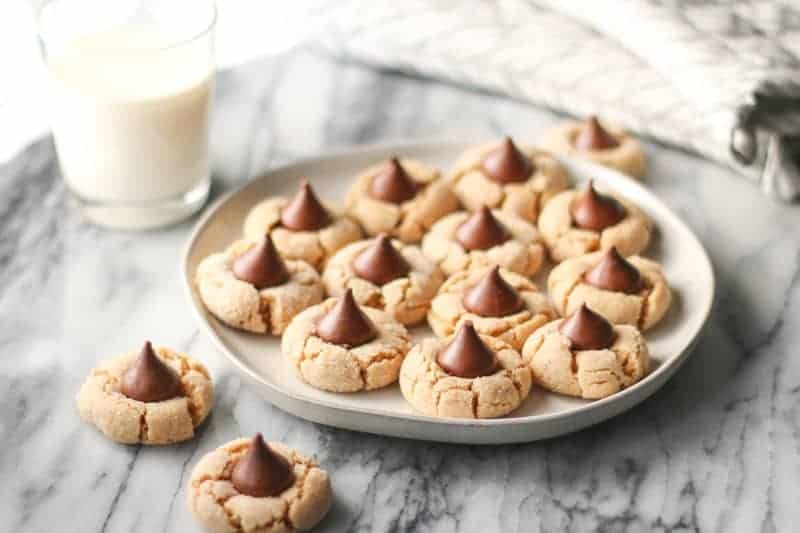 As soon as the cookies come out of the oven, press a Hershey’s kiss on top of each cookie. Be sure to do all of this right on the cookie sheet! Then allow the cookies to cool by transferring them to a wire rack. Oh man, look at that melty chocolate! I mean seriously, if you don’t eat one or three of these right from the oven… you’re missing out! Don’t worry about cracks! That’s what makes them a blossom! Occasionally you may get one that cracks beyond repair… well, I’d say that’s just a sign you’re supposed to eat it. Cool the cookies completely at room temperature. Allow the chocolate to set back up before stacking and/or storing. Otherwise you’ll flatten the chocolate and that would be a bummer. Once the chocolate is hardened again, you can stack the cookies if needed. Then store them at room temperature or freeze in an airtight container. Eat within 2-3 days for optimal freshness. Freeze right away if you need to keep the cookies longer than that. Thaw the cookies at room temperature. You can make the dough 1-2 days ahead of baking. Keep the dough in the refrigerator until you’re ready to bake! These cookies are the perfect cookie to make with little helpers! They can help with so many of the tasks. From helping mix the dough, to rolling the cookies in sugar, and even pressing in the Hershey’s kisses! 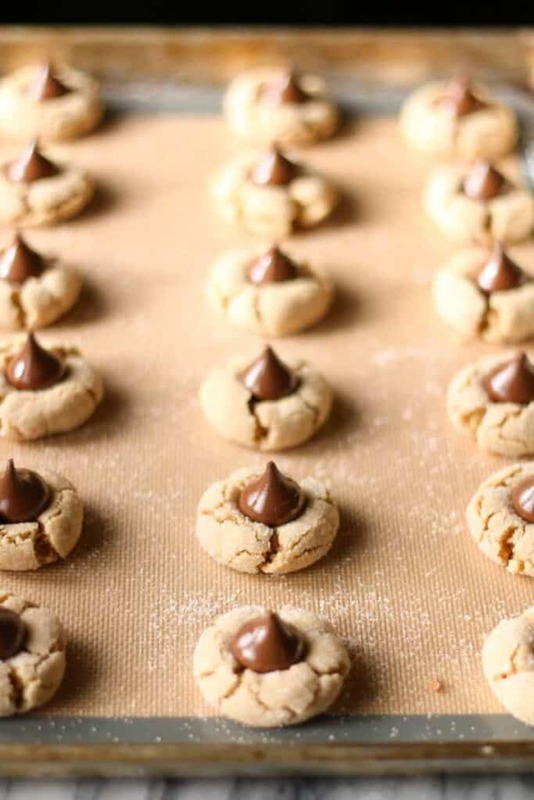 What’s not to love about a peanut butter cookie topped with a Hershey’s Kiss? This gluten-free version of the classic holiday favorite is just as good as the original! Preheat the oven to 375°F. Unwrap the chocolate kisses. Whisk together the flour, baking soda, and salt in a small bowl and set aside. Cream together the shortening and peanut butter until well combined. Add in the sugars and beat until fluffy. Add in the egg, milk, and vanilla and mix well to combine. Add in the dry ingredients and mix again until well combined. Roll 1 tablespoon sized portions of dough into a balls. Then roll the balls in granulated sugar. Place the dough balls on a nonstick baking sheet. Bake at 375°F for 8-10 minutes. 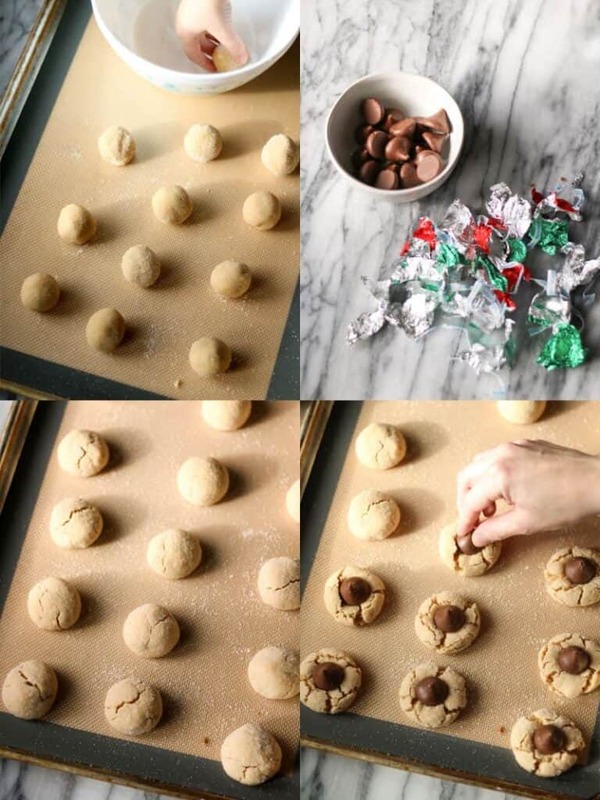 Remove the cookies from the oven and immediately press one Hershey’s Kiss in the center of each cookie. Allow to cool on the baking sheet for a couple minutes before removing to a wire rack to cool completely. Cool the cookies completely at room temperature. Allow the chocolate to set back up before stacking and/or storing. 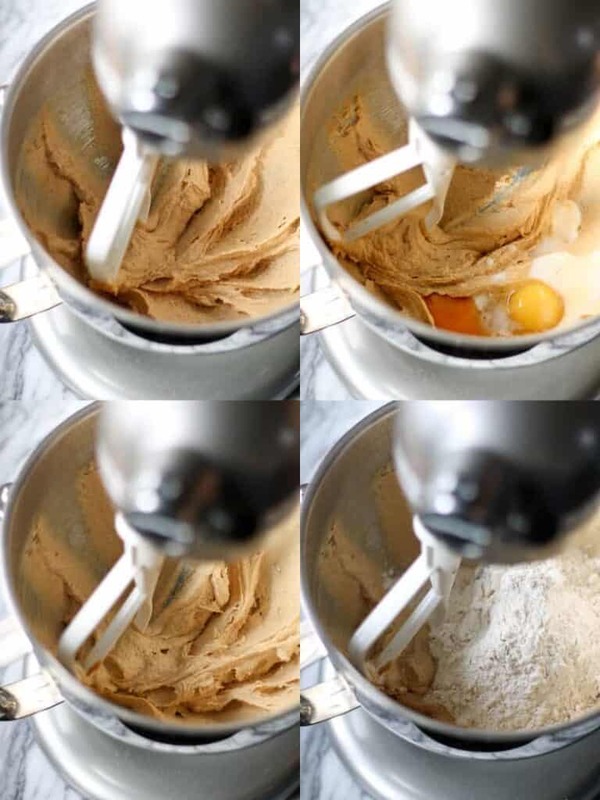 You can make the dough 1-2 days ahead of baking. Keep the dough in the refrigerator until you’re ready to bake. Need more Holiday Cookies? Here’s a recipe for classic gluten-free frosted sugar cookies, perfect for cut-outs! And these frosted pumpkin spice cookies are another favorite! They look delicious! Can’t wait to try them!